Get ready for something that will warm the cockles of your cold, black hearts. Two furry residents of an animal emergency hospital—a kitty who was burned in a fire and an abandoned fawn—have become unlikely friends. Russell the cat was rescued from a house fire over a year ago in Raleigh, North Carolina. Since then, he has been recovering from his burns at Raleigh’s Emergency Hospital and Urgent Care. A fawn named Darla arrived at the facility and the two have become inseparable. Darla was found in someone’s backyard, seemingly abandoned by her mother. 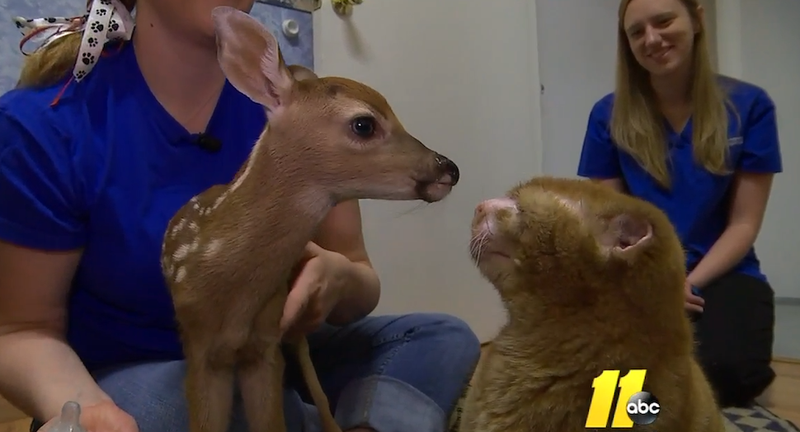 According to 6abc, the cat and fawn are roommates and even share the same bed. Russell has received treatment at the hospital for more than a year but has yet to make a full recovery. Darla is currently being bottle-fed and will eventually be taken to a deer rehab specialist to prepare her for a return to the wild. I don’t want them to have to say goodbye!